St. Louis' Number One Expert in Custom Covers! Because we live in a freezing climate, we winterize our pools to protect them from frozen plumbing and damage to the pool surface. Most pools here are covered for at least six months, which is a long time for your backyard centerpiece to be closed. When it comes to protecting your investment, year after year while maximizing the aesthetic impact of a pool cover, there is no better combination than Baker Pool Service and Loop Loc Pool Covers. We have been partnered with Loop Loc for over 20 years and include a Loop Loc cover with every pool that we build. We build the best pools in St. Louis, and they build the best cover. Here are some features that differentiate them from the rest of the pack of pool cover manufacturers. LOOP-LOC is so durable, it's backed by a 15-year pro-rated warranty and so safe, it may reduce your liability insurance. LOOP-LOC's patented CABLE-LOC™, GAPGUARD® and SECURE-A-GAP® Child Safety Intrusion Barriers close the gap created when a pool includes raised obstructions located at the cover's edge. LOOP-LOC uses extremely high-strength, non-corrosive type 302 grade stainless steel springs for superior weight-bearing capacity. Still, custom covers are only as good as the technicians who measure for and install them. With over 20 years of service, we have honed this skill more than any other pool service company in the St. Louis area. Our experts know what to look for to make sure your cover lasts as long as possible and looks as good as possible! 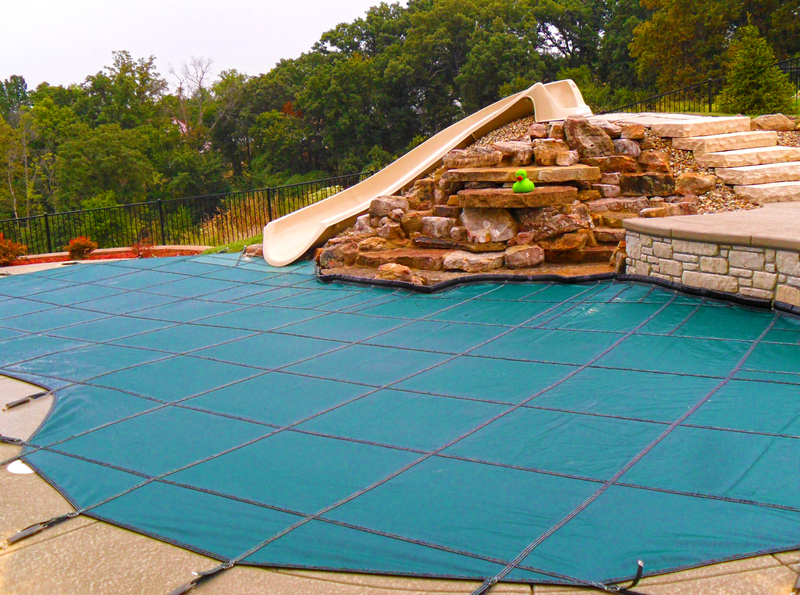 To learn more about what makes Loop Loc Mesh Covers the best choice in St. Louis click here. We measure and install custom covers year-round. For your free estimate, call us at 636-733-9011 or request a quote here!